Shellie Kark is the co-founder of KitchenCUE, a DVD series that is nurturing our country's interest in healthy home cooking and helping people to become better cooks by teaching the understanding of food preparation and presentation. As a professionally trained chef and culinary educator, Chef Shellie translates her vast knowledge into easy formulas that simplify the techniques of cooking. With over 15 years experience in a broad range of capacities throughout the culinary industry, her comprehensive understanding and enthusiastic approach elevates the proficiency of every cook. Chef Shellie studied at the California Culinary Academy and honed her skills at San Francisco's La Folie and Seattle's Dahlia Lounge. Arriving in Denver, Chef Shellie assisted in the development and opening of Cook Street School of Fine Cooking, named one of the Top Cooking Schools by Smart Money Magazine, where she was a leading culinary instructor within the Professional Food and Wine Career Program. 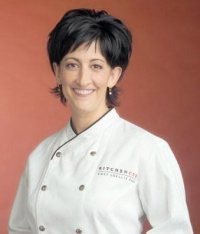 Chef Shellie launched KitchenCUE; a DVD series that uniquely benefits cooks of all levels. With easy steps, cooks of any ability prepare healthy meals with ingredients found in almost any kitchen. Chef Shellie encourages you to be creative, be healthy and be real. She inspires and educates through the KitchenCUE series and in local and national live venues. Chef Shellie and Kitchencue have received numerous accolades. Chef Shellie has had multiple appearances with NBC affiliates, KUSA and KOAA, Whole Foods, Natural Grocers Vitamin Cottage, DPL, Rocky Mountain News, and Gourmet Retailer. She is now a guest contributor for Chefs Catalog, Wine Enthusiast, and has appeared in Oprah's O Magazine under their "Live Your Best Life" section. Chef Shellie consults with authors on recipe development and testing. She is a certified sommelier and a past board member of the American Institute of Wine and Food. Chef Shellie is dedicated to sharing her philosophy of making meaningful connections with family and friends around the table; inspiring cooks to nourish body and soul over a home cooked meal.